Immediately after davening last Wednesday morning, the excited sophomores boarded the buses to start a fantastic two day trip. The trip began by going to a sports complex inside a huge bubble-dome where we played sports such as kickball, ultimate frisbee, volleyball and dodgeball. It was tiring, but loads of fun. After, we headed to the Palisades Center Mall and had a choice of several enjoyable activities including bowling, a ropes course, and ice skating. We then went to Dave n’ Busters to play some games and win cool prizes. 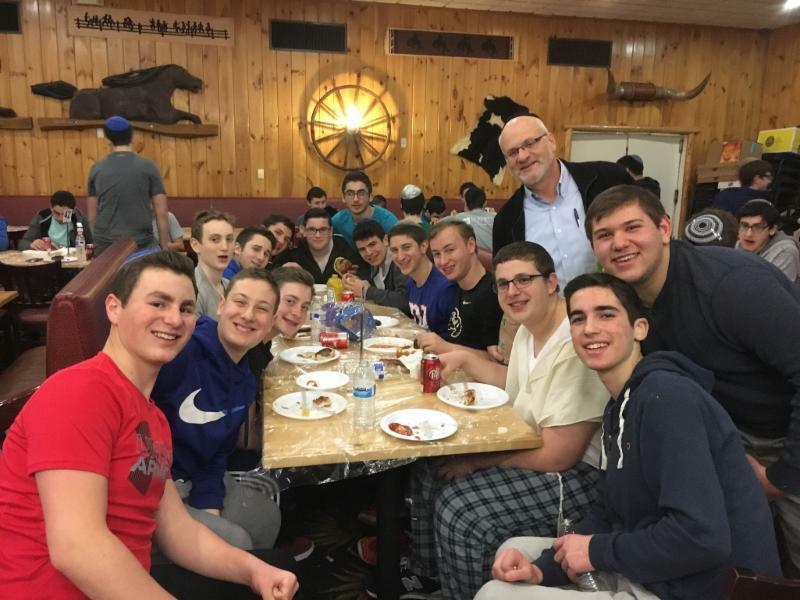 Next, after stopping at ASHAR in Monsey for a special shiur from 8th grade Rebbi (and part owner of Camp Regesh) Rabbi Leibel Chaitovsky, mincha and a delicious dinner, we went to the Pinegrove Dude Ranch. It is a hotel, but with a southern style, with random longhorns suspended on the walls, fireplaces, wooden statues and the like. We got there and settled into our rooms before going swimming, stargazing and roasting marshmellows with Mr. Goldberg, played ping pong, or just chilling. We had a kumzitz with the rebbeim and then, of course, Rabbi Green’s famous midnight barbecue with delicious meat and chicken. We were exhausted, and after a bit went to sleep. The next day we woke up and davened Shacharis and had breakfast and a shiur with each of our respective rebbeim. After, we had a jam-packed morning and afternoon full of fun at the ranch. There was horse-back riding, which let our nature side run loose, with thrilling and scenic galloping through the forests with snow still on the ground. There was also archery and snow tubing, which were both very fun as well. Finally, we participated in a massive paintball event, in which we went in the middle of the woods with camouflage suits and guns stocked with hundreds of paint splattering balls. We were placed on teams and had to shoot our opponents, or capture the flag, to win. After a bunch of thrilling and invigoratingly packed rounds, with everyone having lots of fun, we were all in need of a well-earned lunch. We hung out by the ranch for a bit longer, then headed back to MTA and caught the buses to take us back home from this amazing trip! Thank you to all the rebbeim and faculty for putting so much effort into making the sophomore trip as awesome as it was! For more pictures, visit our Flickr.